Although Moscow was bombed during the World War II, it didn’t prevent the Bolshoi Theater’s actors and actresses from performing on the stage. In October 1941, Moscow was rife with rumors that Germans troops were approaching the suburb of Khimki. Muscovites fled the city en masse, taking highways deeper into the country. In the midst of the chaos, a group of eight young people – students from the Institute of Physical Culture – was in the process of digging a deep well under Hotel National. They were on a mission to mine the city’s key buildings in case Russian troops had to retreat from the capital. The Bolshoi Theater actually proved the easiest one to mine: a well was effortlessly dug out directly beneath the orchestra pit. Related: Lights on at the Bolshoi! Just a few days before the pit was dug, nearly all the theater’s performers and its most valuable props were evacuated to the city of Kuibyshev (now Samara) by order of the government. A collection of Stradivarius violins, along with pictures from the Tretyakov gallery, were taken to the Kazan railway station. The priceless collection was moments from disaster; the train in which they were being taken away from Moscow had barely left the station when the Nazis dropped several high-explosive bombs on the spot where it had stood. The Bolshoi company spent nine months away from Moscow, leaving the building vacant. The front colonnade was disguised using the settings from the classic opera Prince Igor while canvases from the legendary ballet Taras Bulba were mounted into barricades. Painters drew the outline of the theater and the surrounding buildings on the square next to the theater in order to protect the building from a direct hit. Despite these efforts, 1,000 lb. bomb detonated right in front of the theater’s central entrance on Oct. 28, 1941. It was at this time that Moscow, encircled by front lines, was opening its opera and ballet season. With almost the entire Bolshoi company evacuated and the theater itself closed, there were two theaters still operating in the deserted city. One was the Stanislavsky and Nemirovich-Danchenko Music Theater and the other was the Bolshoi Theater affiliate that the government had opened upon requests from the artists who remained in Moscow. At first, the spectators did as they were told. But the audience soon started to refuse to leave, as they wanted to see the end of the show. The audience at that time consisted of war correspondents, workers from military defense factories, party activists, Muscovites and people from other cities who were stopping over in Moscow on their way into the Russian interior. Meanwhile, the main part of the company was settling down in Kuibyshev. In early 1942, while still in evacuation, Dmitry Shostakovich’s Symphony No. 7 was performed for the first time. The composer dedicated the work to his native Leningrad (now St. Petersburg) and the outbreak of the Great Patriotic War (WWII). Finally, by 1943, the artists were finally able to return to Moscow, and the two companies were reunited again as one. By this time, the restoration of the theater building after the bombing was virtually complete. Restoration work never stopped even at 40 degrees below zero in the winter of 1942. As a result of the explosion, one of the building’s outer walls had to be replaced with a wooden structure, and the temperature in the hall matched that outside. Between 1941 and 1945, the Bolshoi artists frequently went on tour to boost the morale of Russian soldiers. During the four years of war, 16 groups of artists were sent to the front lines and gave a total of 1,939 performances. Soviet Leader Joseph Stalin excused nearly 1,000 performers from active duty, although many artists remained on the front line as volunteers. The Bolshoi company performed on the steps of the Reichstag building in Berlin in late April 1945. 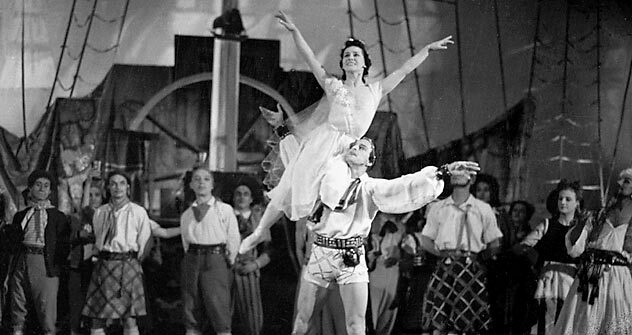 The Bolshoi Theater celebrated the end of the war with two major premiers of Sergei Prokofiev’s ballets Cinderella (1945) and Romeo and Juliet (1946).